The Arabic verb ba‘atha means: to send; Allah, Praise and Glory be to Him, says, “Now send ye then one of you with this money of yours to the town, let him find out which is the best food to be had and bring some to you” (KAHF, 19), “Then after him We sent apostles to their Peoples” (YUNUS, 74). He sends apostles with laws and legislations; He says, “..and God sent Messengers with glad tidings and warnings”(BAQARA, 213). The word ba‘atha also means: to wake someone up from sleep; Allah says, “It is He Who doth take your souls by night,and hath knowledge of all that ye have done by day; by day doth He raiseyou up again, that a term appointed be fulfilled.” (AN‘AM, 60), and He, Glory be to Him, said about theCompanions of the Cave, “Then We roused them in order to test whichof the two parties was best at calculating the term of years they had tarried”(KAHF, 12). Allah, Glory be to Him, resurrects the dead by bringingthem out of their graves and will make them alive again on the day ofJudgment, He says, “As to the dead, God will raise them up; thenwill they be turned unto Him.” (AN‘AM, 36),“One day will God raise them all up for Judgment, then will theyswear to Him as they swear to you, and they think that they have somethingto stand upon.” (MUJADILA, 18), “ThenWe raised you up after your death,” (BAQARA, 56);what the dead will say after their resurrection is mentioned in, “Ah!Woe unto us! Who hath raised us up from our beds of repose” (YA-SIN, 52). 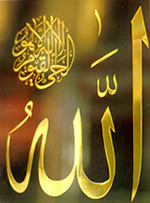 Allah, the LORD of RESURRECTION, resurrects creatures on Doomsday and reveals what is locked up in their hearts and raises up those who are in the graves; He also resurrects souls from the death of heresy to the life of faith and Monotheism; He resurrects all existing things fromthe darkness of non-existence to the light of existence. Resurrection is the creation after death, whereas the present life is the first creation, Allah says, “..and creating you again in forms that ye know not. And you certainly know already the first form of creation, why then do ye not celebrate His Praises?” (WAQI‘AH, 61, 62). We cannot fully understand the meaning of (the LORD of RESURRECTION) unless we know the meaning of (the last creation) and this is impossible before it actually happens. Accordingly no one knows the true essenceof the LORD of RESURRECTION except Allah, and someone’s knowledgethat he does not understand is a kind of perception. Praise and Glory beto the LORD of RESURRECTION, He is Allah.